Dr. Astrid S. Tuminez, Regional Director, Legal and Corporate Affairs (Southeast Asia), Microsoft, also participated in last month’s World Economic Forum (WEF) in Myanmar. 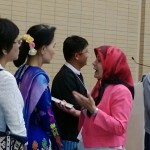 Astrid was inspired by Daw Aung San Suu Kyi’s comments, especially when she underscored that how people invest in her country will be an extremely important factor as to whether or not people’s needs will be met, their culture and environment preserved, and their country achieve sustainable development. With close to 1,000 delegates in attendance, WEF on East Asia demonstrates that there is a huge global interest in Myanmar among world political, corporate and non-profit leaders. WEF in East Asia did not have any sessions on women’s leadership, and it would be a good idea to propose such a session when the regional WEF convenes next year in the Philippines. 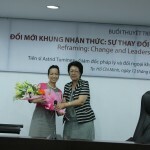 Dr. Astrid Tuminez with Madame Ton Nu Thi Ninh at Ton Duc Thang University in Ho Chi Minh City. 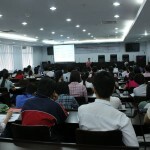 Dr. Astrid Tuminez giving a lecture to students at Ton Duc Thang University in Ho Chi Minh City. On June 10 and 11, Astrid also gave lectures on leadership at the Ho Chi Minh Academy of Politics and Public Administration. Participants in the program included some of Vietnam’s most senior leaders. Although women were a minority in the group of approximately 68 officials, they were nonetheless some of the more energetic participants. A significant part of the lecture addressed gender mainstreaming in leadership. This program was sponsored by UNDP, whose work on gender mainstreaming in Vietnam is important for changing mindsets and for developing Vietnam’s human capital. On June 11, Astrid also delivered a lecture on leadership to students, professors, administrators, and private sector executives at Ton Duc Thang University in Ho Chi Minh City. Many participants after the session asked questions about work-life balance for women in leadership positions. Madame Ton Nu Thi Ninh, a veteran and key supporter of the Women Leaders of New Asia Initiative, hosted the talk at Tri Viet Institute within Ton Duc Thang University. Astrid S. Tuminez is Microsoft’s Regional Director of Legal and Corporate Affairs (LCA) in Southeast Asia. She is also an Adjunct Professor and the former Vice-Dean (Research) of the Lee Kuan Yew School of Public Policy (National University of Singapore). Previously, at the U.S. Institute of Peace, she assisted in advancing peace negotiations between the Philippine government and the Moro Islamic Liberation Front. Dr. Tuminez was also Director of Research for alternative investments at AIG Global Investment. In the 1990′s, she ran the Moscow office of the Harvard Project on Strengthening Democratic Institutions. She was also a Program Officer at the Carnegie Corporation of New York and a Life Member of the Council on Foreign Relations.